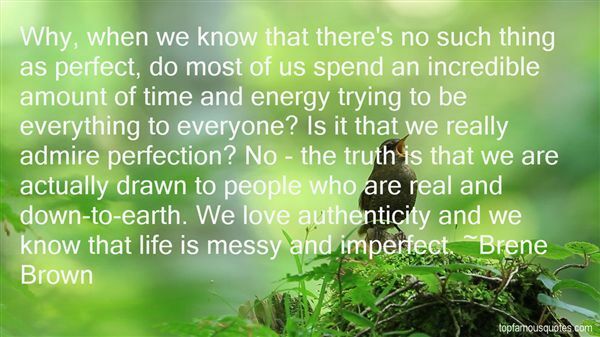 I love Brene Brown and her quote that is listed above is so true!! I have taken the words perfect and perfection out of my vocabulary.They just don’t work for me anymore in my language or thought. I have never reached “perfection” and whatever that means. I never will. I have reached Good, Great, stupendous, fantastic…..completion. I do my best to put out good product. I work very hard to work hard. I am achieving based on that alone. I do LIVE TV. You can prep for a show. DO a great show rundown, and get a guest that is phenomenal. THEN the cameras comes on and your chair drops a few inches or the sound goes out for no reason. You have to roll with the punches on LIVE TV. That has taught me alot that I carry into life in general. You do the best you can, always! But don’t try to strive for a goal that you will never reach because in reality….it isn’t there.